Hyacinth bulbs are fragrant and deer resistant. Shown here: Easter Joy Hyacinth Mix. Few garden plants give some much delight to the gardener in return for so little care. I consider planting bulbs to be a present to myself; you plant them in the fall and of course by spring you've forgotten about it. Then comes the surprise gift when they awaken and bloom. The key to creating a really great spring show with bulbs is plant lots of them in "drifts" or big groups of the same plant. This is especially important when growing the smaller ones like crocus, miniature daffodils, wildflower tulips and miniature iris. When six are good, 12 or 18 is better. And I find these drifts of bulbs are more visually impactful when you mix the drifts of separate colors rather than mixing the different colors of individual bulbs together in the bag before placing them into the ground. Although this is a personal preference I find that the eye is able to relax and enjoy larger patches of color more readily than trying to visually sort the colors in a mixed planting of random colors. When using an auger or a planter, be sure the soil is moist (not wet or soggy) as this will help the hole to hold its shape and not fill in right away with dry dirt. I keep a bucket of blended Yum Yum Mix and good quality compost (half and half) alongside me so I can drop a handful of the mix into the bottom of the planting hole. This enriches the soil and gets the bulbs off to a good start. Bulbs and perennials are great companion plants. Mixing bulbs in with taller, late spring/early summer blooming perennials will also help to camouflage the bulb's foliage as they go dormant. Groundcovers like Thymus and Veronica are also excellent bulb companions. Imagine a carpet of color with lots of colorful bulbs popping through! 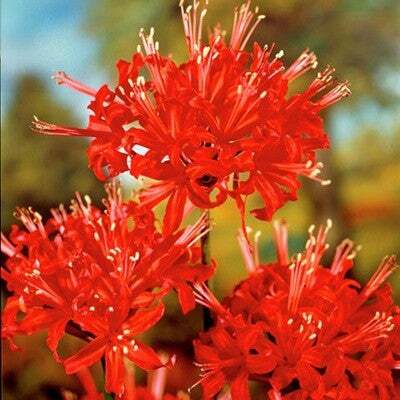 Lycoris radiata (Naked Ladies) - This incredible bulb has been cultivated for centuries and originates from China, Korea and Nepal. These deer, rabbit and gopher-proof bulbs require a couple of growing seasons to re-establish themselves and bloom. But the wait is worth it when these spectacular plants come into fall flower. The foliage follows the following spring, hence the common name "naked ladies", blooming without their leaves. Hyacinth orientalis (Fragrant Hyacinth) - These fragrant beauties are a mid-spring delight blooming in shades of blue, pink and white. Deer, rabbit and gopher resistant too. Fritillaria rubra (Red Crown Imperial) - A impressive specimen in flower, this orange blooming Crown Imperial thrives in rich, well drained soil and blooms in mid-spring. They are deer resistant and a great companion plant with mid-spring daffodils. 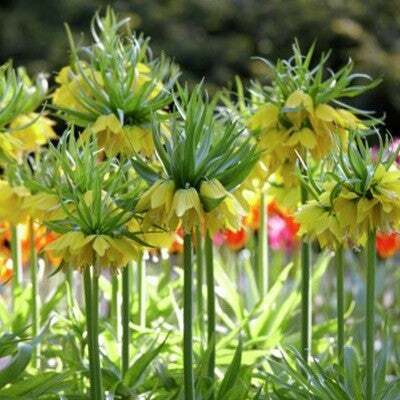 Fritillaria lutea (Yellow Crown Imperial) - an equally impressive yellow flowered species of Crown Imperial. Ipheion (Spring Starflower) - Native to South America, this fabulous genus of spring flowering bulbs is often overlooked in favor of more familiar names. Having enjoyed these care-free, critter resistant spring bloomers in my Mother's garden for the past 25 years, I can recommend them without hesitation. They live forever and bloom for many months beginning in early spring. 'Alberto Castillo' (white) and 'Charlotte Bishop' (pink) are two newer selections that are a "must have" in your garden. 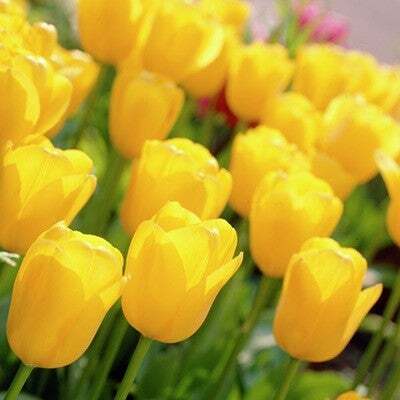 Tulipa 'Golden Apeldoorn' (Darwin hybrid Tulip) - 'Golden Apeldoorn' shines in late spring with its glowing yellow flowers. Because 'Golden Apeldoorn' and the other colorful Darwin cultivars are perennial, there's no need to re-plant them each year like the common annual bedding tulips. Plant them deep (eight inches) for years of enjoyment. Text and Photos By David Salman © All articles are copyrighted by High Country Gardens. Republication is prohibited without permission.